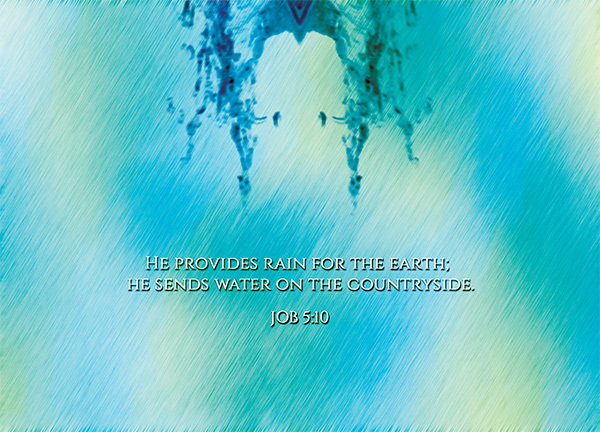 He provides rain for the earth; he sends water on the countryside. How is the rainfall like, wherever you’re from? Where I live it rains quite regularly – almost daily. Not torrential rains, but you can expect a light shower in the afternoon almost everyday. Imagine the days when there never was rain? When the world never had rain, when the world didn’t need rain? The time before the Great Flood? Imagine Noah running around telling them that a flood is coming and they will all perish, and the people laughing in his face because they’ve never even encountered rain before? Once upon a time, rain used to be a wonder. In this study, we will look at the terms reserved by Eliphaz to describe the phenomenon of rain as he details to Job how great their God is. This happened in the first speech Eliphaz made as a direct response to Job’s pessimistic monologue earlier. We will ignore the Job issue in this study, but merely focus on the greatness of God and appreciate something we often see as common and mundane – rain – as a wonder of God. Today if you jump around and celebrate at the sight of rain, I must assume that you live in a dry area and are going through some kind of drought. In many places, we’re so used to seeing rain that it no longer shocks or surprises us. In fact, it may even dampen our mood or spoil our plans. How many times have you heard christians praying for good weather, which means no rain, just so that an event could be held smoothly? These days we no longer see rain as a wonder, but back then it was. Rain was God’s way of transporting water without pipes. In the immediate context of this verse, Eliphaz highlights the greatness of God – and it is not a flawed argument this time. He performs wonders that cannot be fathomed, miracles that cannot be counted [Job 5:9], exclaims Eliphaz. What does he say next? He talks about rain next, as if rain is a wonder that cannot be fathomed, a miracle that cannot be counted. Surely it must have been, back in those days. They lived in the desert, in a land and place far away from the sea and likely far away from a source of water – they are extremely reliant on rain. And it is known that desert or acrid lands have lower rainfall than everywhere else. I’m not sure if they know how rain is formed back then, but science has taught each and every child the process of evaporation and condensation today – an amazing phenomenon that serves as magical pipes and transports – no, teleports water from the lands to the clouds. In ancient Chinese mythology rain is given by the gods. Rain falls when the heavens cry. Undoubtedly, while rain does not come magically out of nowhere – it is such a natural and sophisticated process and the foundation of the water cycle – God does have control over it. He draws up the drops of water, which distill as rain to the streams [Job 36:27], He says to the snow, ‘Fall on the earth’, and to the rain shower, ‘Be a mighty downpour.’ [Job 37:6]. He covers the sky with cloud; he supplies the earth with rain and makes grass grow on the hills [Psalm 147:8]. In Elijah’s time, with just a command he withdrew rain from the people, and there was a great drought – it didn’t rain for 3 years [1 Kings 17:1]. Rain is a blessing, even if we complain about it all the time. He has shown kindness to you by giving you rain from heaven [Acts 14:17]. Yet perhaps the most important thing about rain is that it’s kind of like a public good. We don’t pay for it. We don’t earn it. We don’t do anything for it. And everybody enjoys it, when it rains. He causes his sun to rise on the evil and the good, and sends rain on the righteous and the unrighteous [Mt 5:45]. It’s a universal blessing. It’s a universal wonder. It’s a universal miracle. That is how our God is. I’m not great in science, so I won’t go into the intricacies of how rain is formed, but surely you know briefly too, the water cycle and how important rain is to us, even though technology has evolved and we do have other ways of creating potable water or forcing rainfall through cloud seeding. Today rain may be just a common weather to you – it could be a nuisance to have a rainstorm when you’re running late for work, it could be a relief when it rains in the midst of some kind of a heat wave. But something as commonplace and mundane as rain was once seen and regarded as a wonder and as a miracle. In all justice to rain, it probably still is a wonder today – just like how the human body is a wonderful machine but yet we take it for granted because it has become so mundane to us. God is great, and if you’re looking for a miracle, if you need another proof of God’s greatness, look no further than the downpour yesterday.